I'm pleased to report that after day one I am feeling fine. No new sore muscles and no real fatigue. Of course we didn't ride today either. Bike assembly and orientation. I've always said that there is a fine line between a hobby and mental illness. This seems like a fine group with which to step over that line. Twenty+ riders, some very fit, others in my category. 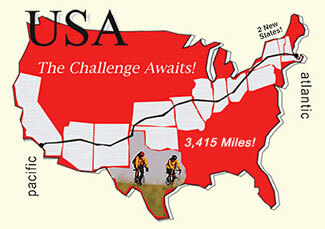 Many have ridden across the country multiple times. It should be interesting. LA to Riverside tomorrow. 79 miles. Hey Dad - Having a great time in Phoenix this weekend. It was a cool 102 yesterday... was exhausted after 2 hours sitting poolside in this heat. Enjoy the desert stages! I'll call Michigania to tell them you will need a golf cart to get around camp this summer. Be safe! I am Darin's mom and decided to follow your trip via the blog Anna told me about. I wish you a safe and wonderful trip!! What an adventure!!!! We wish you all the best on your amazing adventure across the country. Be safe and stay focused - that means no cell phone or texting while operating your vehicle. We are still hoping to get a glimpse of you as you blaze through Ohio. Enjoy the ride!